I always like running along the water. 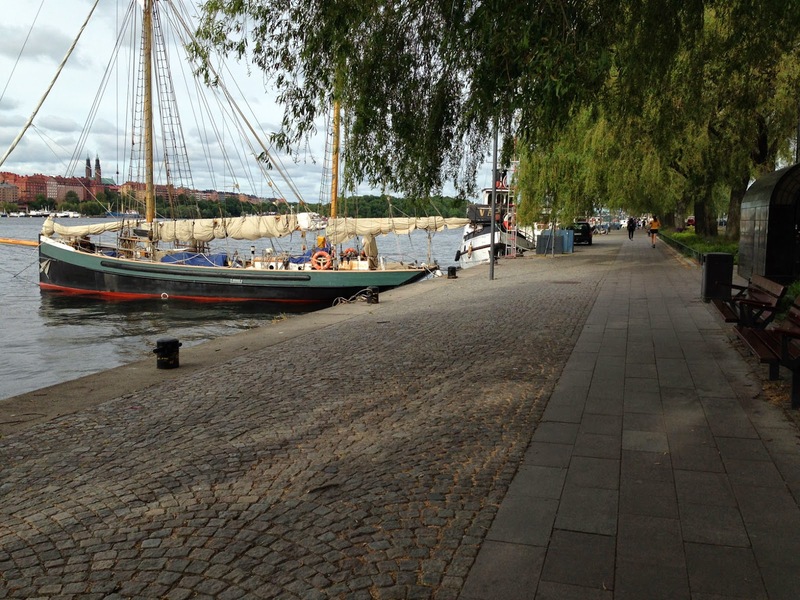 And Stockholm is the perfect spot for that: the whole place is a labyrinth of bays, fjords, lakes and rivers. It's hard to tell what's an island and what is mainland. 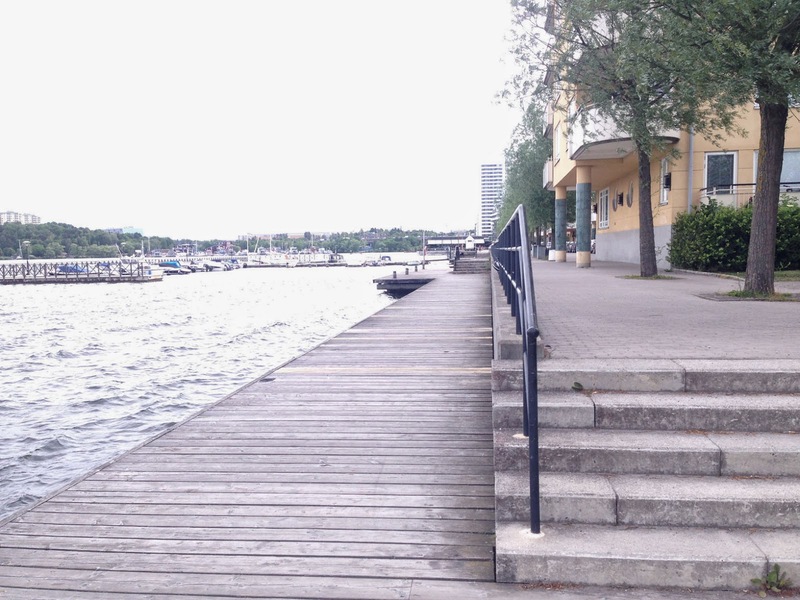 This is a waterfront run on the west side of the city center, around Kungsholmen (Kings Island). 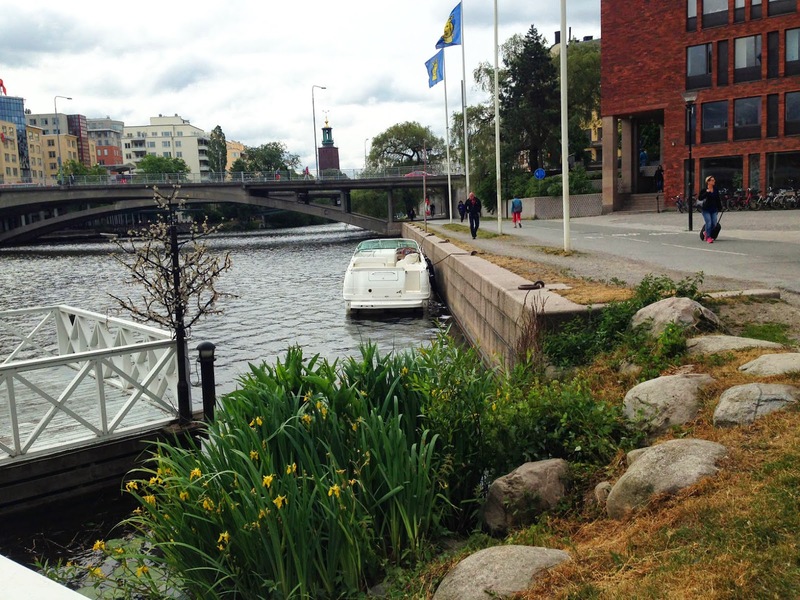 The perimeter of Kungsholmen is 9 kilometers, making it a perfect island for a moderate run. You can run directly at the water's edge for almost the whole time, except for one small detour of about 200 meters on the west side of the island. Most of the waterside trail is paved, but there are some gravel sections. We'll start at the southeastern corner of the island and loop it, running clockwise. 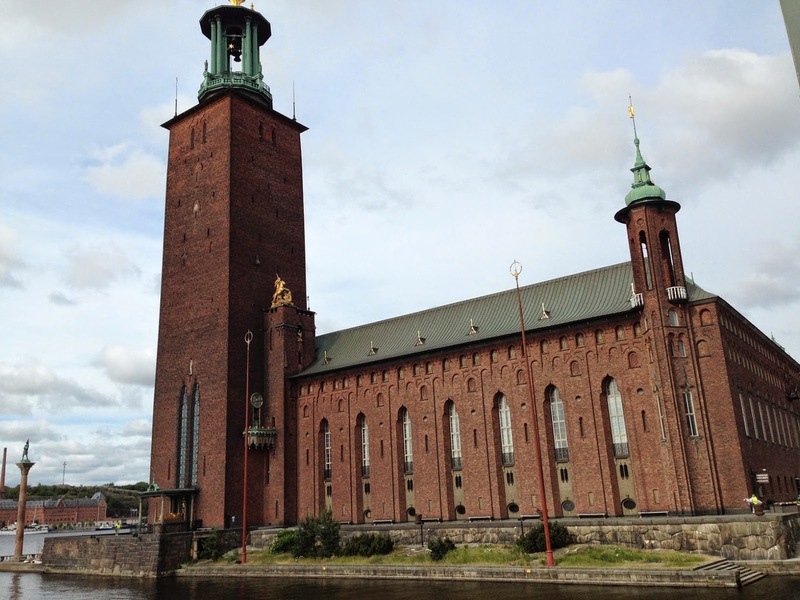 The Stockholm city hall (Stadhus), with its strange tower, is over there, just across the Stadshusbron (City Hall Bridge) from downtown. The city hall is right on the water, with water on two sides. Standing there at the bridge, turn south to face the stadshus, with its huge tower right in front of you. You can normally run right along the water next to the city hall, turning the corner at the back side and then continuing westwards along the south shore of the island. If the gate to the stadshus waterfront terrace is locked, just run around the other side of the building. After the city hall, the first section of shore is lined with fishing boats, with a street right next to the waterfront sidewalk. After a kilometer, a narrow, tree-lined park begins lining the shore. 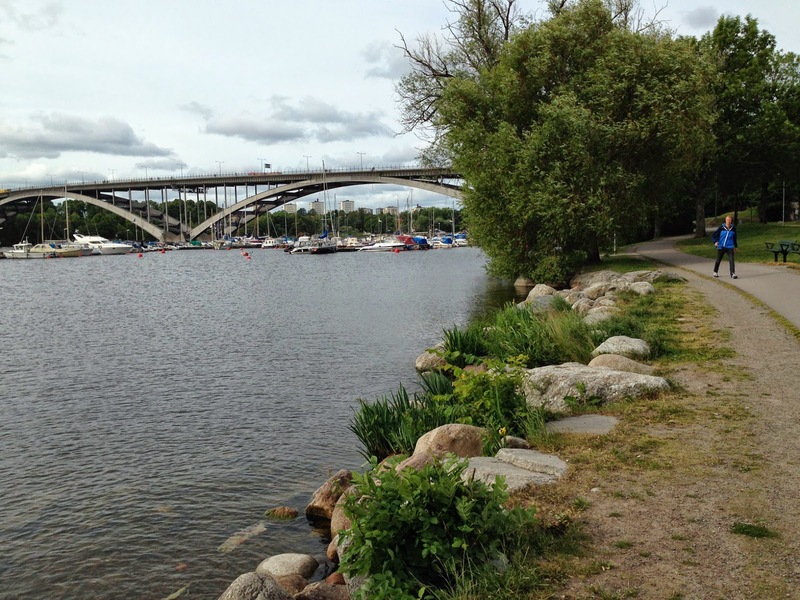 You will see the broad arches of a bridge ahead that you will soon run beneath, the Västerbron. Before getting to the bridge, at 1.5-km, the shore turns to the south, where a larger park is located. Always staying at the water's edge, run under the bridge and then past the little lawn with a beach. Everything is much quieter here: no cars and hardly any runners/walkers on the trail. The trail leads through trees and rocks along the shore. After going under another bridge at about the 3-km mark, the trail goes up and meets the road above -- to get around a cliff-- before descending back down towards the water. It will soon go under a much bigger cement freeway bridge, and then continue along some more cliffs. You will be up at street level again, but just stay on the trail as it goes back down towards the water and past the cliffs. As you circle around to the western side of the island and the trail turns northwards, you'll have to make the one detour inland around a small valley. 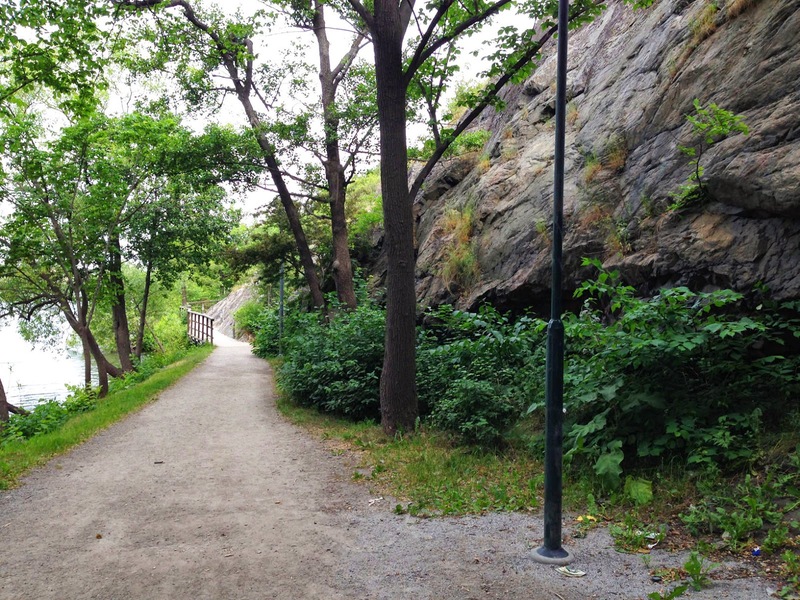 The trail will turn inland for 200 meters into a park. In the park, run towards the street ahead that goes over a small stone bridge. Cross the bridge to your left and then immediately turn left again onto the paved trail that heads back to the water, on the other side of the little ravine. You'll immediately go under the next big freeway (and train) bridge. You're near the Kristineberg T-train station. There is more natural shoreline here. As you come to the northwestern shore, you'll start running past a lot of new apartment buildings along the waterfront. The whole shoreline in this area has been rebuilt, with new docks and parks along the wide bayshore, which once was industrial. When the shore starts curving so that you are on the north side of the island, the distance to the opposite shore is narrowed, and it looks more like a river or canal between you and the land on the other side. There are more parks here as you go under two more bridges. After the water gets wider at a little marina, at about the 6.6-km point, you will now be running directly next to a road, and it will stay that way all the way back to the starting point. But there will always be a separate path for you next to the water. At the next bridge, you'll be running across from the main downtown. The buildings on your side might look familiar, if you took the airport express train when you came to town. The train runs along the other shore. Now just follow the waterside path as it goes under a few more bridges, and you'll see the city hall tower ahead in the distance. At 9.2 kilometers, you'll be back at the city hall bridge.